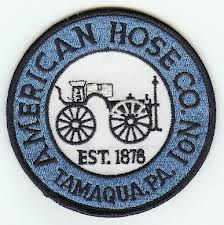 0628: AHCO, East End, Tamaqua Rescue and Tamaqua EMS, respond to the intersection of East Elm and Schuylkill Ave for reported accident with injuries, reported to be into a pole with wires down. E776 responding, update from county one vehicle a garbage truck into a pole, pole damaged with wires down. E776 on scene, requesting PPL. E778 responding, to go to top of Elm for traffic control, E775 responding to report to Market and Union for traffic control, Tamaqua Rescue to cancel. PPL foreman on scene. Crews contained the scene, requesting fire police. Units on scene for 45 minutes, fire police remained on scene to assist PPL with traffic control. Pics and video compliments of Tamaquaarea.com.